A man’s accessories speak volumes about the kind of person he is. If it’s a tie, the color and design give away his personality. Perhaps it’s a hat, and the design reveals his sense of style. But nothing communicates the way a watch does. It’s not just about being a time piece. A watch reveals so much about the wearer. So what does the Casio G Shock GA 110TS 1A4 say? It reveals a rugged nature. It screams masculinity. It shows strength. The man wearing such a watch is catapulted to a league higher than most. This watch fears nothing and the man wearing it will be considered fearless as well. I’m not exaggerating. Casio has garnered a reputation of being creators of perfect timepieces. 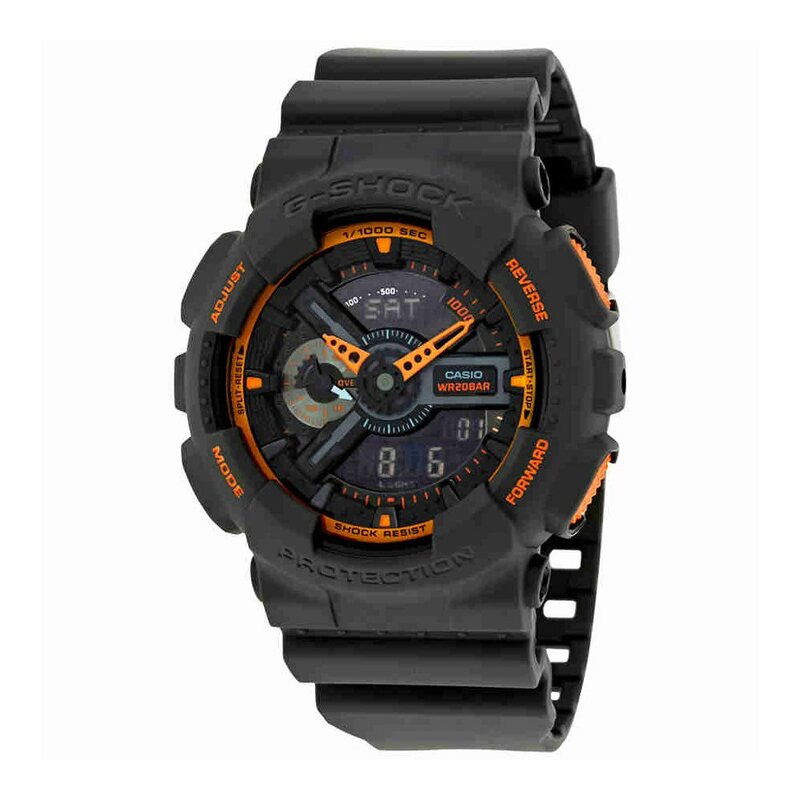 And the Casio G Shock GA 110 TS is no exception. It’s for the outdoors. This watch loves a challenge. So, let’s dive into the Casio G Shock GA 110TS 1A4 analog-digital watch review without further ado. This is a fitting to start this review. Casio’s iconic G Shock is a feature found in their tactical watches which grants them superior resistance against mechanical shock. I’m talking about a hard bump against a surface or a drop from a significant height. These watches can withstand such kinds of shock, allowing them to emerge undamaged. The Casio G Shock GA 110 is gifted with this amazing quality. Having the G-Shock, this watch will handle the rough and tumble of the outdoors with ease. Still, G-shock alone isn’t enough to keep the watch in good order. That’s why Casio also included water resistance qualities in the GA 110. This watch can amazingly withstand the harmful effects of water to a depth of 200 meters. That’s a whopping 660 feet of wading depth. This spectacular feature makes the Casio G Shock GA 110 great for professional marine activities and other water sports. Still, being out in the rain shouldn’t bother you as the watch is unperturbed by wetness. This watch is clad in a 55mm thick resin case. Is this a good thing you ask? Well, definitely. The resin is a scratch resistant material and having it encasing this Casio watch means it’ll keep scratches from branches and rocks at bay. Also, it’s easy to clean so you can effortlessly keep the watch in good shape. Finally, resin ensures the watch remains comfortable to wear. It neatly wraps around your wrist and allows you to go about your business with ease. The face of the watch is predominantly black that’s accentuated with orange dials. This orange improves the visibility of the analog watch. It allows you to be able to tell the time even in low light situations. Further, the Casio G Shock GA 110 also has an auto LED that illuminates the face allowing you to tell the time when in the dark. You can set how deep you want the LED to light up. It then automatically goes off after this period elapses. If you’re a constant traveler, you’ll appreciate how important it is to know the time in your destination and the time back at home. And always having to reset your watch tends to get on one’s nerves. But with the Casio GA 110, you don’t have to bother finding out as the watch shows time in 29 time zones. This gives it the capability of showing the time in 48 different cities. With this handy feature, you can easily shift between the time at home and the world time. With the G-Shock quality, this watch can withstand mechanical shock, making it perfect for outdoor use. The Casio G Shock GA 110 also has the water resistance of up to 200 meters or 660 feet making it good for professional marine activities. This watch is also resistant to magnetic exposure. Clad in a resin material, the watch easily resists scratches. The orange analog watches hands make it easy to read. With auto LED, the face can be made visible in dark situations. The world time functionality allows you to know what time it is in 48 cities in 29 different time zones. This watch doesn’t have solar power capabilities. There is also no atomic timekeeping in this watch. Q: Does the Casio GA 110 TS have an inbuilt thermometer? A: No, this watch doesn’t have that feature. A: The battery should last two years. Q: What is the weight of this watch? A: It weighs 2.4-ounces only. So this watch has proven to be the perfect tactical watch. Put to the test, and it delivers without hesitation. Everything about it screams durability and strength. From the resin material to the water and magnetic resistance, the GA 110 is an unstoppable watch. Whether your hiking, camping or swimming, this watch will remain on your wrist and not utter any complaint. And being a Casio brand, you’re assured of reliability. This is no doubt the perfect tactical watch for you.